Carol Lita Capotosto, was born Jan 16, 1936 in Margate, Kent England, to Jacob (Jack) Oberman and Ellen (Nellie) Sutton. However, in the fall of 1940 Carol came close to not reaching age 5. One night during the Blitzkrieg her family took refuge in a church. The next night, by chance, they stayed elsewhere and that church was destroyed in the bombings of London by the German Luftwaffe. 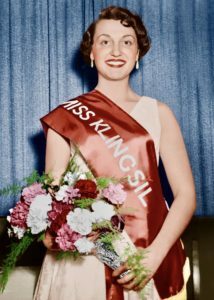 When Carol entered a beauty contest in 1955, she was crowned “Miss Klingsil” by her employer, the manufacturer of ladies stockings. Leisure time for Carol was spent at Dreamland Ballroom, the local dance hall. But it soon became her destiny, when a “yank” US Airman Peter J. Capotosto, Manston Airbase, England, swept her not only off her feet but ultimately off to America. They married Sept 1956. Together they had daughter Angeline in England. Then after settling in the “States”, (Staten Island, N.Y.) Sons Peter, Paul and Philip were born. North Shore people, they lived in St. George, Tompkinsville, Port Richmond and West Brighton. Mum to her kids, while living on Victory Blvd in 1969, she became Fire-Mum, and put out a kitchen fire accidently lit by her 3 year old. The FDNY kidded her to join their ranks. Early 1970’s times were tough and Mum was forced to visit the Welfare Office and apply for aid for a short time. Dispiriting for any family, quite distressing for a young English mum of 4, not yet a citizen. In 1975 Mum, tired of going on welfare, decided to provide for the family herself. She began cleaning houses but pay was meager, with no medical benefits. So she learned of a new State program known as SETA, it offered temporary positions in the housekeeping department of St. Vincent’s Hospital at a reduced wage. She took the job anyway as she preferred work over handouts. Mum worked there for over 25 years, and even went to school to become an EKG Tech, but that position never materialized. Finally she became a Nurse’s Aide in the maternity ward, a position she truly enjoyed, and retired in 2001. Mum, a sixty year Staten Islander, is survived by her 4 children, Angeline Napolitano, Peter, Paul & Philip Capotosto. Brother Michael Oberman, grandchildren Nicole, Diana, Frank, Kristina, Gabrielle, Christian & Vincent. Also, Seven great-grandchildren, and a multitude of nieces and nephews who all affectionately called her Nanny Carol. Carol Lita Capotosto passed away peacefully on Sunday, April 22, 2018 at Staten Island University North. Visitation will be held at Cherubini McInerney Funeral Home on Sunday, from 2 to 6pm with a blessing in the funeral home at 5:30pm. Private cremation on Monday and an interment of cremains at a later date. Having read Ms. Capotosto’s obituary, it is obvious she was a remarkable woman which is reflected in her children, one of whom, Paul, I have the pleasure of knowing. Paul didn’t become the person he is by accident. I extend my heartfelt condolences to the entire Capotosto family.